The barrier between illustration and gallery art is perhaps more permeable than ever. Artists whose primary focus is on either side are moving between the two worlds with increasing frequency. William Low is primarily an illustrator, though his illustrations look more like gallery pieces than most illustrations, and his gallery work is in pretty much the same stylistic approach. Low paints bright, immediate images of real world scenes, sometimes almost impressionistic, at other times richly detailed, that often have a appearance of traditional landscape. They have a feeling of painting done to convey a sense of place more than to tell a story. His landscapes and cityscapes evoke a time of day and atmosphere, and can be particularly resonant with the wistful appreciation of a moment, perhaps a lost moment, and therein lies the storytelling component. He also has a fascination for sunlight and atmosphere within architectural spaces, particularly 19th Century style steel and glass roofs. 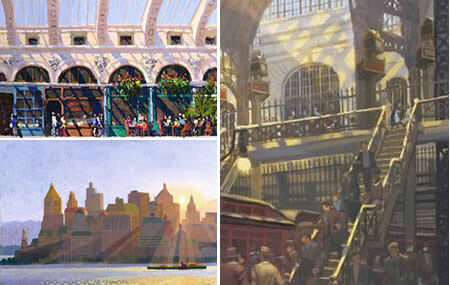 Though he has illustrated numerous books, his approach and disposition made him the perfect artist to handle the challenge of his latest project, a beautiful children’s book that recreates the lost glories of the old Pennsylvania Railroad Station in New York (image above, right). Old Penn Station, which is both written and illustrated by Low, was the basis of his masters thesis at Syracuse University and, when he realized it could be a terrific children’s book, became a labor of love, requiring many hours of research to reconstruct one of the great lost landmarks of New York. There is a short video linked on the home page of his site in which Low tells the story of the project and its evolution from thesis project to published book. There are also galleries on his site of illustration and gallery art, though they employ a “must keep your mouse over the thumbnail to see the image” navigation that I find annoying. Unfortunately, his gallery on Folioplanet, is hampered by the same limitation and small image size. You can still get some feeling for the appeal of his work, however. Don’t miss the additional sections for Cityscapes, People and Still Lifes within the Illustration section of his site. Once again you have succinctly summed up an artist’s appeal, Charley: The charm of William Low is that he’s a very painterly illustrator and a very illustrative fine artist at the same time. I also think that he has a way of simplifying shapes and colors that are not so easy to reduce to their essentials, but, once done, make our bustling, grand and complicated cityscapes comprehensible and appealing, even to children. In that regard, he is very much like Chris van Allsburg or David Macauley. I’m also proud he lives in the same town I do. Thanks for the comments, as always, Dan. Low certainly does have a knack for taking on complex subjects and rendering them with clarity.